يقع Broadwater Resort Apartments Como في كومو, برث, هو خيار شائع بين المسافرين. يمكن من هنا للضيوف الاستمتاع بسهولة الوصول إلى كل ما تقدمه هذه المدينة النابضة بالحياة. إن سهولة الوصول من الفندق إلى المعالم السياحية الشهيرة الكثيرة في المدينة كمثل Canning Bridge Arts Markets, بيرث, مسرح اولد مايل هو استثنائي بحد ذاته. إن الخدمات الممتازة وحسن الضيافة العالي في Broadwater Resort Apartments Como تجعل إقامتك تجربة لا تنسى. تتضمن الميزات الرئيسية في هذا الفندق: واي فاي مجاني في جميع الغرف, متجر, تخزين الأمتعة, واي فاي في المناطق العامة, صف السيارات. في Broadwater Resort Apartments Como غرف نوم يزيد عددها عن 58 صممت بذوق وعناية لتوفر لك كل وسائل الراحة . بعضها يحتوي أضاً على تلفزيون بشاشة مسطحة, حوض الاسترخاء, غرف لغير المدخنين, مكيف هواء, تدفئة. يقدم الفندق مجموعة رائعة من الخدمات كمثل حوض استحمام ساخن, ساونا, حمام سباحة خارجي, حمام سباحة داخلي, سبا، لجعل إقامتك تجربة لا تنسى. إن Broadwater Resort Apartments Como هو مكان مثالي للمسافرين الذين يتطلعون إلى الراحة والاستجمام في برث. We were welcomed when we arrived and shown how to operate the gates to park securely in the property. Our one room apartment was comfortably appointed, there was heaps of space for the two of us to get comfortable. The apartment has a kitchenette with all the appliances one would need. The big surprise was finding a washing machine and clothes dryer in the bathroom. We were there for only one night but I can see that would be a boon for anyone staying a number of days. I used the jacuzzi at the pool, the temperature was great. I did find the step into it was very deep and was difficult for me to manage safely. Perhaps an intermediary small step would have made it less risky. Part of the pool is under the roof so it’s sheltered from the weather. Pool towels are at reception. We slept soundly the only disturbance was from noisy pipes which whistled very loudly and for a long time. I will be booking in there again for a night when we next travel to Perth. Friendly check-in by staff and clean apartment. 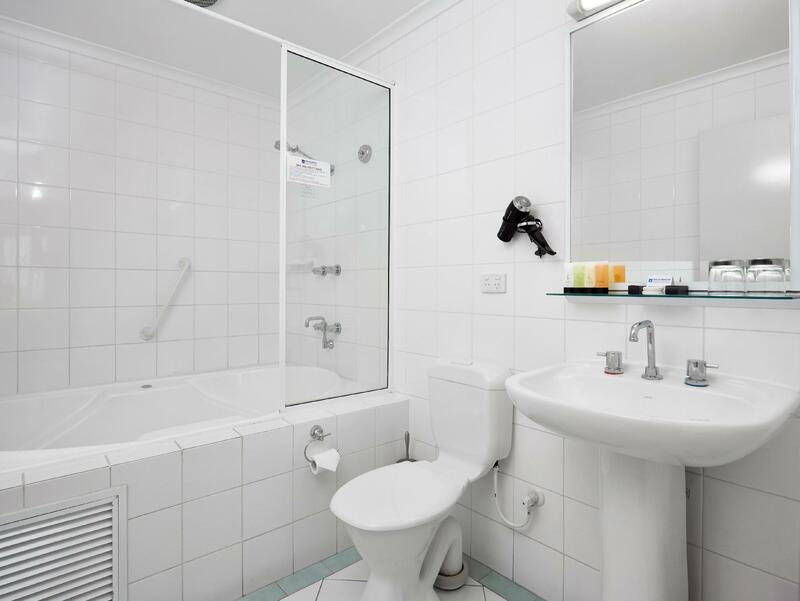 the only concern was getting in and out of the shower/spa as there was no step up and the height of the bath would be difficult for people with limited mobility. 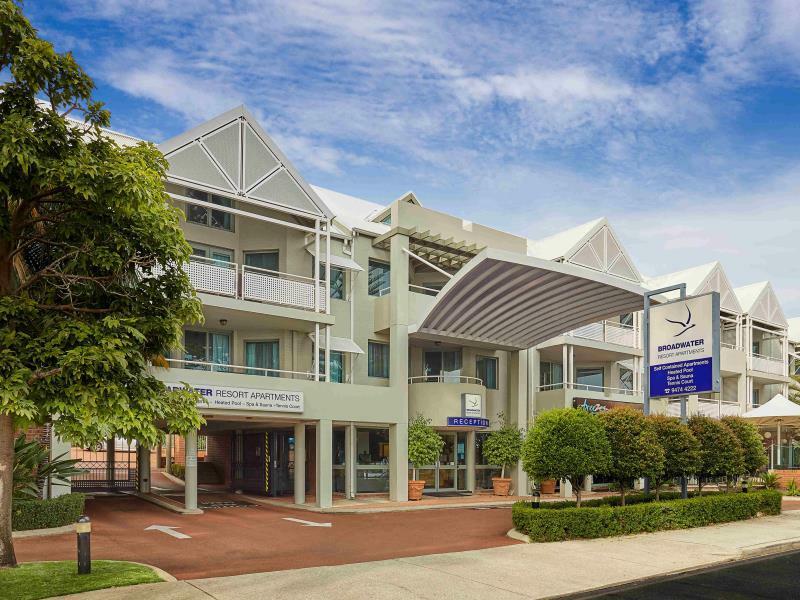 Great location, close to shops and restaurants, secure parking and really friendly staff. Would definitely stay there again. Size of the room, free parking, supermarket around the corner. Was told we were in one of the biggest rooms, two bedrooms with king size beds, and it was massive! Staff very helpful and accommodating. Windows opened allowing for fresh air. Great value considering parking included. Great hotel for the family. Good facilities and easy location if you have car. Amazing restaurant around the corner. Only issue is there are no lifts so be prepared to get your workout in carrying luggage. We booked a room at this resort as it ticked the boxes of being a 2 bedroom, 2 bathroom unit and could accommodate our request for 2 x single beds and a queen bed, and also had a swimming pool and spa pool. 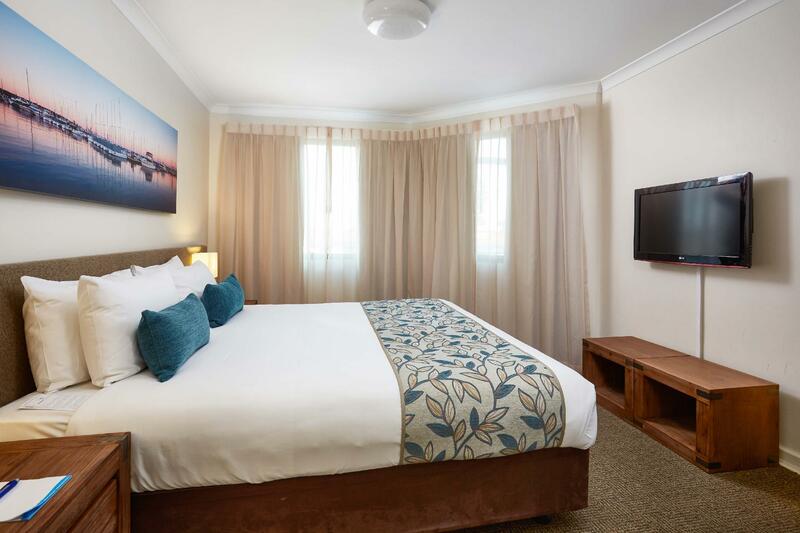 We would definitely recommend this as a base for anyone's holiday in Perth, however it takes a while to sort out the best transport options into the city etc, and would therefore be easier if you had your own car and not have to rely on bus and train timetables! everything was good enough more than expected ..even though old resort but refurbished n well maintained...facilities good n convenient ...pool ,spa.,sauna were really good for kids n good location to reach for city only one thing bad was...bathroom wasnt clean stains on floor n dryer inside was so dusty but i recommend this resort highly to traveller only reMind this to housekeeper ! ah !! guy staff had blonde hair n wearing bluse shirts and young was helpful n kind n excellent treatment customers ..he gave us good impression .. 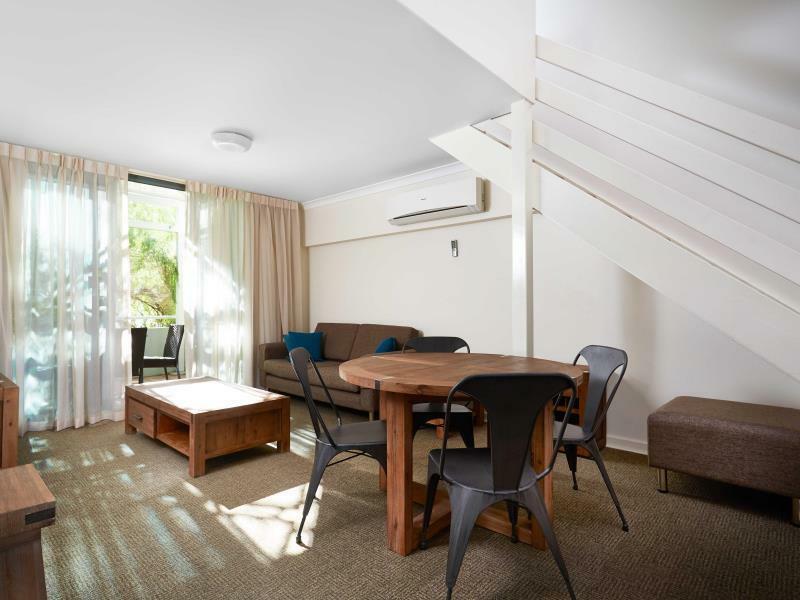 This is a great location for families traveling to the city from the bush. We have stayed here a heap of times and it's just perfect for young families. Staff are awesome, food is great and the rooms are setup perfect. A little dated and sometimes, you will end up with a room that needs a tidy up or is getting old, but for a traveller, it's home away from home. Great place and will always stay here when down in the city. Everything we needed, nice decor, comfortable bed. We made good use of the washing machine and dryer , pool and spa, car parking. Access to city was simple and Como area had nice restaurants. Agoda price made it very good value. I stayed here the night prior to my wedding and the night of my wedding. I found the rooms to be clean and well maintained and was very happy with the service we received from both the Resort Staff and the Restaurant staff. I would definitely stay here again. We spent three days there with four grandchildren, great place for kids. The rooms were spotless. The only thing I think there should be airconditing in all the bedrooms as the room were rather hot, other then that a great place to stay. This is a very quiet and scenic place. this is not the main area where all the other hotels are located transport mainly is bus which has a schedule. Service finish early. I was around during Christmas therefore transport was even more difficult.There is a supermarket abt 5 mins away. If during festive season ,advise to get a better location. 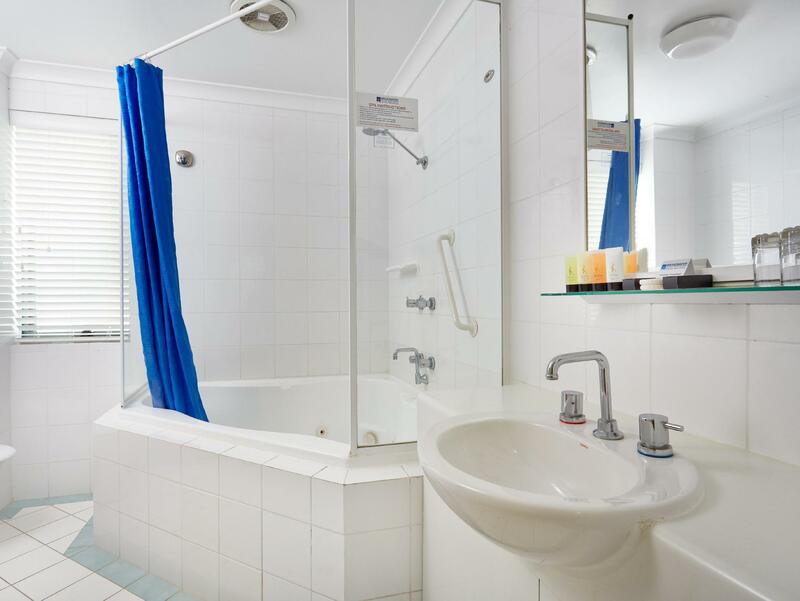 Otherwise, this is an accommodation with complete facilities for cooking, washing, drying. Also have a spacious bathroom , tennis court and pool. The location in relation to our visit was excellent.The bed was sensational and the front of house staff very helpful, friendly and efficient. It was a very acceptable stay. room was comfortable if not a little warm and airless and air con only in the living space, I neglected to ask for a fan, which I believe that have if required! It was quite a noisy location opposite the freeway, so window open meant constant noise. So apart from a little stuffy, great people and bed.